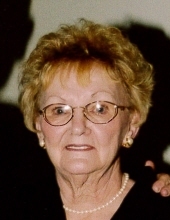 Mary E. DiSalvo, 92, passed away Sunday, Feb. 24, 2019. Mary was born in Akron, Ohio, to the late Charles and Elizabeth (Beasley) Wilson and lived in the Cuyahoga Falls area most of her life. She was very instrumental in the day to day operations of DiSalvo Construction and volunteered at St. Thomas Hospital for over 30 years. In addition to her parents, Mary is preceded in death by her husband, Carmen DiSalvo. She is survived by daughters, Susie (Ed) Heatherly, Christine (David) Henderlight and Debbie (Dennis) Rhoads; son, Buzz DiSalvo, grandchildren, James and Elizabeth (John); great-granddaughter, Hailey; sister, Kathy Binkley; and many other loving family and friends. Mary's family would like to extend a very special thank you to the staff at Maplewood Memory Care and Southern Care Hospice for the loving and compassionate care. At her request, a private service will be held. You are invited to hbm-fh.com to view Mary's tribute wall, offer condolences and share memories.